Prayer is an important part of the life of any church, and CBC is no exception. We seek to nurture the prayer life of both individual and community, whether we are gathered or scattered. We aim to encourage and explore many ways of praying and in doing so learn to listen to the God who made and redeemed us, who loves and cares for us. How and when do we pray together? House groups are places for prayer as well as for teaching and discussion. Church members have also set up prayer triplets (with the occasional quartet!). In our bi-monthly church members’ meetings we pray about our decision making as well as pastoral needs. Prayer spaces create exactly that – a space in which to pray. We have monthly men and women’s prayer breakfasts. There is an email prayer chain available to alert members to specific prayer requests. 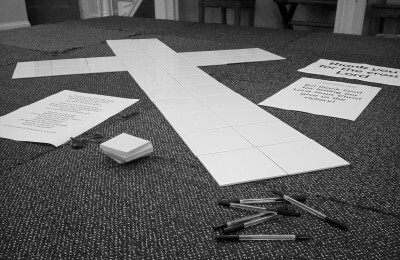 As well as gathered prayer as part of Sunday services, one to one prayer ministry is available in the ‘prayer corner‘ directly after the Sunday morning service.